You may be interested in purchasing quality kitchen appliances that you can use to make cooking easier. When it comes to quality kitchen appliances, Cookworks is a brand that you can trust. They have various products including coffee makers, kettles, toasters, hand mixers, and more. Save as much as 80% on selected items when you buy from your favourite UK retailers including Argos and eBay. To save money on your kitchen appliance purchases, use the latest cheap Cookworks UK voucher codes. Get great value for your money and only get high-quality kitchen appliances. 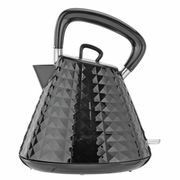 Cookworks Textured Kettle and Toaster in Black Reduced from £29.99 to £19.99! The latest Cookworks discounts and voucher codes in the UK! Whether you are looking into preparing your daily smoothie, brewing your morning coffee fix or prepping sandwiches, Cookworks is always there to help you out with its wide range of kitchen appliance. Get to find the ideal kitchen appliance without having to break your bank. Their kitchen collection is way cheaper compared to other brands, but of course, at the same time they don’t compromise on quality. Get massive savings on your Cookworks purchases with the help of Latest Deals. Our community of bargains hunters always share verified deals and special offers from Cookworks company. Shop with confidence and take advantage of the voucher codes, discount codes, and coupon codes on a wide selection of Cookworks products including toasters, kettles, rice cookers, coffee makers, and all essential kitchen appliances. We also have a team of money-saving experts who always share the best shopping tips and tricks you can use both online and instore. You can find a lot of Cookworks products on sale online. Most UK retailers have regular sale events as well as seasonal clearance sales and flash sales where you can get as much as 40% off on select appliances. Also, if possible, wait for their Black Friday and Boxing Day sale offers where you can get some serious money off and amazing bargain deals. You can maximise your savings by using the latest Cookworks voucher codes you can find here at Latest Deals. Get additional discounts on your purchases and there are also times when you can even get freebies and free shipping. The special offers we have here are available for a limited time only, so grab them right away before they expire. Do not forget to bookmark this page and never miss out on all the amazing deals and savings just waiting for you. 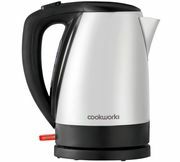 Cookworks specialises in providing UK families access to quality kitchen appliances and kitchen electricals that won’t cost them as much as the typical kitchen tools do. This well-known cookware brand is owned by Argos, a British retailer operating in both Ireland and the UK. They have quite a large collection of cheap kitchenware –from breakfast preparation appliances and devices all the way to microwaves and multipurpose ovens. Yes, you read it right! We’re listing down the top breakfast finds under ten pounds that you should seriously consider. Aside from each item’s functionality, its price is something you cannot just turn away from. Here is a list of your breakfast preparation companions that won’t cost you over 10 pounds. Cookworks Filter Coffee Maker. If you cannot start off your day without a dose of caffeine, this cheap coffee maker can do wonders for you. Get to prepare your daily coffee fix without any hassle. This features a semi-permanent water tank and a permanent filter. It has all the basic features of a coffee maker that usually costs more. A great find below ten pounds. Cookworks 2 Slice Toaster. 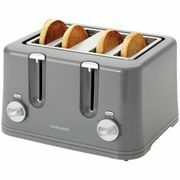 An entry-level toaster that settles into any theme, colour scheme or style your kitchen has. This stainless steel toaster features defrost, reheat and cancel options. It also has a crumb tray that keeps your working station crumb-free. Cookworks Kettle. This kettle doesn’t have fancy built-in features but it surely gets the job done and the water boiling. This cordless kettle has a generous capacity of 1.7L. Imagine how many cups of tea this can prepare in one go. Cookworks 2 Portion Sandwich Toaster. If you are hungry and at the same time in a hurry, then this sandwich toaster can take care of half of the breakfast preparation for you. This trusty sandwich toaster can create 2 rounds of sealed sandwiches in a jiffy. It features non-stick coating making it easy to clean up after use. If you are thinking of a few kitchen additions, why don’t you consider going with Cookwork Appliances? Its price tag and functionality are something you simply can’t find anywhere. Here are some of the top Cookworks appliances every UK home must have. Cookworks Hand Blender with Accessories – Stainless Steel. Whether you are needing to prepare meals or smoothies, you can never go wrong with this hand blender from Cookworks. Achieve fine and smooth results without putting in too much effort. This comes with whisk attachment and chopper attachment. It also includes a beaker where you can store your yummy creations. Cookworks Blender & 2 Cups. Be on the go without missing a meal. This very durable blender is easy to use and comes with a shatterproof jug ideal for small portion preparations. It has a capacity of a little over half a litre. Cookworks Slow Cooker. Slow cooking is a cooking process that allows the meat to bring out maximum flavour. If you are down for some mouthwatering meat meals, then this slow cooker is ideal for you. This features 3 heat settings that will allow to keep up the quality of the cooked food. It comes with an oven safe ceramic bowl that has a capacity of 6.5 litres. Perfect for family gatherings. Cookworks Illumination Kettle. Make your morning to-do’s just a bit easier, including the preparation of your daily pick me up hot beverages with this handy kettle from Cookworks. It features an automatic opening lid making refilling easier and also a washable and removable limescale filter. It has a capacity of 1.7L. Cookworks Health Fryer. Are you craving for your favourite fried meal, but too guilty to splurge in? Well, be guilty no more with this revolutionary health fryer from Cookworks. This fryer can cook fried food with a dramatically lower fat content. Instead of using a heaping dose of oil, this unit only requires one spoonful. It functions by circulating hot air to cook the food to yummy and crispy perfection. It comes with a removable bowl and a mechanical timer. It has a capacity of 0.7kg.